The story of a family’s flight from Burma when Japanese troops invaded during World War Two. Re-imagined by a fascinated descendant, the book follows the fortunes of different family members as the British raj collapses around them and they escape, ill-equipped, across mountain passes to India. Jean Ellis studied history at the London School of Economics, the School of Oriental and African Studies and Chennai University, writing her doctoral thesis on south Indian politics between the two World Wars. She has worked for UK and international charities in Asia and Africa. Jean Ellis’s elegiac account of the evacuation of civilians from Burma in ‘Goodbye Burma’ is a joy to read. She skilfully weaves a seamless robe of fact, fiction, family history and the complex political and military history of Burma. The result is a dynamic, tense and gripping yarn. Ms Ellis contrives to combine the art of the novelist and the analytical skills of the historian in a most effective way. Jean Ellis’ account of the exodus from Burma during WWI provides a powerful and fascinating insight into a lesser known chapter of British history. Her descriptions of a way of life collapsing rapidly in the face of the Japanese military advance and set against the steamy backdrop of Burma are highly evocative but, as the book progresses, increasingly painful. Jean’s characters, drawn extensively from members of her own family, all have strong and highly individual voices that tell the story through a multitude of lenses. This book is a real triumph. This is a moving and beautifully written book. It follows the experiences and the incredible journey made on foot by those forced to flee from Burma over into India during WWII. I couldn’t put it down. I was gripped by Jean Ellis’s storytelling from the beginning. By the end I had engaged with the characters and willed them to get to their destination in India, although this was never the end of the story for them. Through fictionalising factual family documents, Jean Ellis led me to understand more about the colonial situation and the chaotic withdrawal of the British from Burma. I then went on to investigate more about other ethnic groups mentioned in the the book, for instance the Naga people and the current situation of the Rohinga. I would never have read a factual history account without reading this very engaging book. Reading Goodbye Burma brought back childhood memories of my dear father who was serving with the British Army on The North West Frontier before WW11 broke out. He was drafted into India and then Burma after the Japanese invasion and was there in the Burmese jungles long after VE Day as the Japanese fought on. He never spoke of the horrors of war but told us instead about the exotic fruits, plants, birds and animals. Also of the places he’d seen which Jean Ellis’s book brought back to me as I recognised some of the names. From other comments I have read you have opened up many thought provoking avenues. Well done Jean. Very well written, researched and touching book revolving around a fasinating era of history. The authenticity shines through as is clearly inspired by the author’s family experiences. Good Read! A very captivating read made more “real” and contemporary by the current situation in that country. Having recently visited Burma, I found Jean’s absorbing and well researched book extremely helpful in documenting the complicated history of the war years and Britain’s forced exodus from one of its colonies. Today one has to search very hard to find evidence of the British legacy but Jean’s excellent book brings to life the very hard times experienced by members of her family as they are forced to take one of the most treacherous journeys across mountainous terrains, lakes and valleys to escape the Japanese military. Never are they to enjoy such privilege again. This is a brilliant book! Really well written. Loved it. Loved the book. I learned a lot about Burma and the amazing journey made by Jean’s family during the war. Wonderfully written and I would fully recommend reading it! Burma is close to my heart as my brother was killed in action towards the end of WWll, when he was 23, and is buried in Taukkyan War Cemetary. “Goodbye Burma” is a fascinating book, telling stories of the British exodus from various perspectives. Jean Ellis deftly pulls the reader into the lives of the evacuees. We feel their pain and triumphs; breathe in the humid air; see the wonderful scenery; marvel at the clouds of beautiful butterflies rising from a rotting corpse along the way; and above all, sense the menace of the ever-advancing enemy. I thoroughly recommend this beautifully written book, and let’s all think of the plight of the Rohinga being driven from Burma today. I enjoyed this book. It was easy to read and packed with interesting aspects of a country I know little about. The descriptions bought alive a fascinating country, harsh but beautiful. I liked the way different characters came in and told their story-linking both historical events and personal experiences. For me,this book is a reminder of how life as we know it can be changed, beyond recognition, by events over which we have no control. A powerful book. 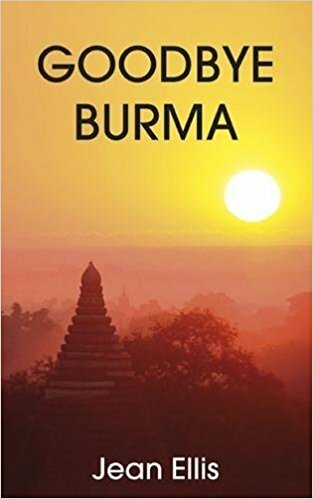 A memorable book which weaves fact and fiction, and tells the story of a period of history of history which l knew very little about.It shows the way a privileged family in Burma gradually came to terms with the reality of their journey and endured it with dignity and love for each other. Fascinating. The story of this exodus has waited too patiently to be told. At last we have a sense of the chaos, confusion, pain, and heartache experienced by those forced to leave a place they loved. The author is to be commended for giving voice to this experience through the diverse characters, distinctive details, and engaging plot lines. A compelling and moving story of a family fleeing Burma as the Japanese attacked. Inspired by the personal diaries of family members, this book gives an enviable account of their privileged life before the invasion and the harrowing journeys and hardships endured by those who were ill-prepared to undertake them. It is a fascinating insight into that time in history, brought to life through the vivid characters and the beautifully evocative descriptions of the country they loved. The gripping story of a family’s flight from Burma when Japanese forces invaded the country in 1942. Jean Ellis has drawn on her own family’s experiences to recreate in fiction the dramatic events of that time: the break-up of a way of life, the chaos and confusion, the perilous trek across the mountains to India. This is history brought alive superbly, with freshness and present-day relevance. This is a book about devastating loss, and the horrific consequences of war, but also about the bonds of family, and triumph of the human spirit in extreme adversity. “Goodbye Burma” is very well-written and conceived, with wonderful, evocative imagery, faithful historical context, and brilliant use of the English vernacular of the period. The result is a remarkable achievement, and “Goodbye Burma” is a great read! The story flows from the heart and core of an individual, whose reflections are tempered by time, but nonetheless, with deep seated emotions from the early and mindful moments. This isn’t a tour guide, but a intimately felt, and somewhat candid, recounting of a person’s experiences, in the context of our familiar history. Eight members of our own family perished on the trek out of Burma in 1942, so Jean’s book brought home to us what they must have gone through. It was skilfully woven and so evocative of a beautiful country and a way of life overturned by tragic circumstances. Burma has never recovered its former peace and glory, more’s the pity. Jean has done a superb job! I really enjoyed this book – I came to really care about the characters and the gradual disintegration of their lives. I loved the use of multiple voices and perspectives. I must confess to not normally reading history or non-fiction, but I surprised myself by loving this touching story. Jean’s book gives a vivid picture of the chaos in Burma as the Japanese advanced and the experiences of individuals as they escaped to India. It is a piece of raw history, brilliantly told and a compulsive read! I found this book exciting and could not put it down. It tells of terrible times in Burma which affected inhabitants for the rest of their lives. I found this book a really touching and moving account of ordinary people caught up in terrifying circumstances when they finally realised they had to leave a life and a country they had always loved and called home. My own family had to leave India around the same time and Jean’s account helps me understand a little of what they, too, must have felt. My family were part of the exodus out of Burma and Jean’s book captures the mood perfectly whilst weaving facts into the story. Although I was only born after these events 42 members of my family set out, separately and by different routes, on the Trek with many dying en route and this book is a fitting remembrance and tribute to those who started the journey. It has a leading place in my Library of events during this critical time in our History. A thoroughly good read that I would recommend anyone whether their families were impacted or not. I just loved this book and felt totally engaged with the characters. I’d love to know what happened next. A very important reminder of a part of our recent history. The exodus from Burma at a terrifying time needs to be recalled and this book does it brilliantly, reminding us, too ,how bravely people can behave in appalling circumstances. This chimed with part of my experience as my father served in Burma although he did not mention it in any great detail. Jean Ellis’s beautifully written book was a powerful evocation of the situation there in 1942 and I learnt much from it. Her skill in weaving historical research and the lived experience of family members as expressed in their diaries is consummate and every reader will be enriched by the story of these events. A very well written and researched book, a real page turner which is hard to put down. Jean Ellis has managed to beautifully combine real life events with historical facts in Burma. I loved this book. I learned a lot about Burma and how quickly war impacts on a community. The struggles of the community and the journey made by Jean’s family during the war was amazing to experience. A few of my clients and I read this book together and all agreed how wonderfully written by Jean it was and I would fully recommend reading it! Great book! A thoroughly enjoyable read and very well written. Congratulations Jean on the nomination, it is well deserved and I wish you the best of luck. Reading Goodbye Burma, I felt I was there, suffering the trials and tribulations of the trek over the mountains . The various voices she uses are very convincing as being from that time with the underlying colonial attitudes of the British coming through in subtle ways. Fascinating – and I want to know what happens next! A family history supported by meticulous research. The combination makes an interesting and very human account of the upheaval suffered by ordinary people when they are caught up in historical events. An engrossing read, stimulating a deeper inquiry into those particular aspects of the Second World War and that region, both before and after the period depicted in Goodbye Burma. Jean’s first novel is peopled by a diversity of characters who draw you into an inquisitiveness about their pasts and their futures. Will this become the central part of a trilogy? An enjoyable and very interesting read. For me, the way this book highlighted the history of Burma at the time of the Japanese invasion whilst also portraying the lives of the characters involved and their subsequent struggle to survive was certainly a story worth telling. The last few years have seen a couple of books which deal with the remarkable story of the mass evacuation of civilians fleeing from Burma as the Japanese overran the country in the first months of 1942. Michael Leigh’s book is a thoroughly researched academic study which places its emphasis on the Indian evacuees, by far the largest number. Felicity Goodall’s book, Exodus Burma, focuses on the experience of British evacuees and is very attractively packaged with photographs both historic and modern. Jean Ellis’ book adds another dimension, the story of members of her own family, who found their comfortable, well-to-do lives shattered by the rapidity of the Japanese advance and the collapse of the colonial administration. The story is based on a diary, family papers and recollections and is an interesting blend of fact and fiction. Ellis’ background as a South Asian historian gives the story historical accuracy and solidity. What she does with the factual material is to add imaginative elements which really do give a feeling of the varied experiences of evacuees and the emotions that they went through. This is remarkable. What shines through is a family love of Burma and a real dread of what leaving it and the family houses and possessions may mean for them. This book has taken me back to the days of my families escape from Uganda. The book is poignant, fascinating and well worth the read. A very well written account of a part of history I had not known about. The characters are well-drawn and the story is vividly told. A remarkable book born of real experience and very well written. Congratulations Jean!